Though Latin descriptions by poet, Decimus Ausonius, about winemaking in the Roman dominion of Gaul are traceable to the 4th-century, it wasn’t until the early middle ages that wine export from Bordeaux began in earnest. With the fabled marriage in 1152 of Eleanor of Aquitaine to Henry Plantagenet (future king of England), they not only bore a near-mythical son, Richard the Lion-heart but also fostered a monopoly of wine trade between Bordeaux and England. The discerning customers on England’s side of the Channel would eventually nickname the region’s wine as Claret. With endless warring between the English and French disrupting trade for centuries, it was a long wait to the 1600’s when Bordeaux’s near-neighbours in the Netherlands began increasing their imports and consumption significantly. The Dutch applied a host of innovations such as sterilizing the Oak storage barrels, which made longer-term conserving of the wine possible and a proportional expansion of travel distances to new markets. Finally, they also gifted the wine world one of its premier terroirs by draining the estuary marshes and creating arable land for vineyards in Bordeaux’s sub-region of Médoc! Bordeaux’s complex patchwork of 38 sub-regions encompassing 65 AOC appellations, also divided into a lengthy list of individual, legendary plots, is somewhat more decipherable with the understanding that most take their names from a select set of towns and villages. Moreover, they’re further distinguished by being grouped around the Gironde Estuary at the region’s Atlantic end, or inland along the converging Garonne and Dordogne rivers. 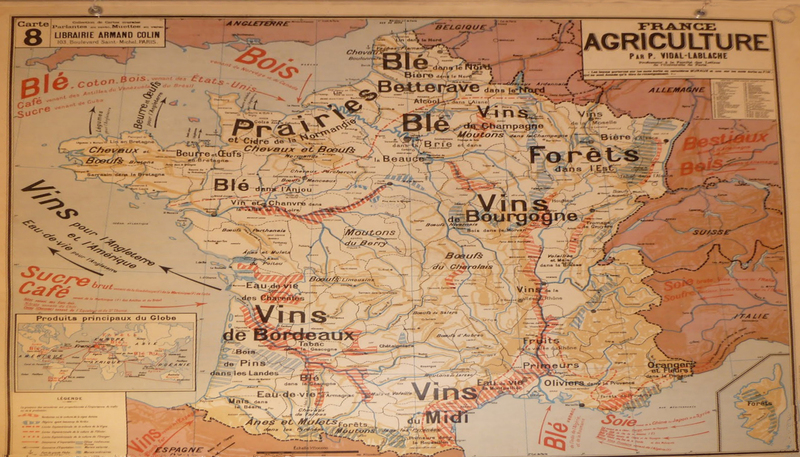 Lastly, the paths of those three waterways, as a diagonal line through Bordeaux, provide demarcation for which of the vineyards and wines are of so-called Right or Left Bank origin. North of the Dordogne is Right, south of the Gironde and Garonne is Left. An added anomaly is the sizeable zone between called Entre-Deux-Mers (‘Between 2 Seas’). It all adds up as a delightfully bewildering patchwork of sub-regions that are home to a vast collection of 7,375+ wine-producing Châteaux! As for price-point, the loose designation of Petit Château encompasses thousands of producers who don’t qualify as Cru Classés: the five top-tier, Bordeaux classifications. In some cases, petit château vineyards are next door to those of highly touted brands. In rarer instances, there are microclimate and soil composition factors that result in markedly differing wine character from adjacent plots. However, cost and desirability tend to reflect the reputation of a particular vintage, vine age, and how much production investment there’s been by the estate. Despite a perception that Bordeaux’s offerings tend toward premium pricing, a majority of Bordelais and Bordelaises vintners sell their approx. 630 million bottles of red and white wines, reasonably, at between $15 – $25. 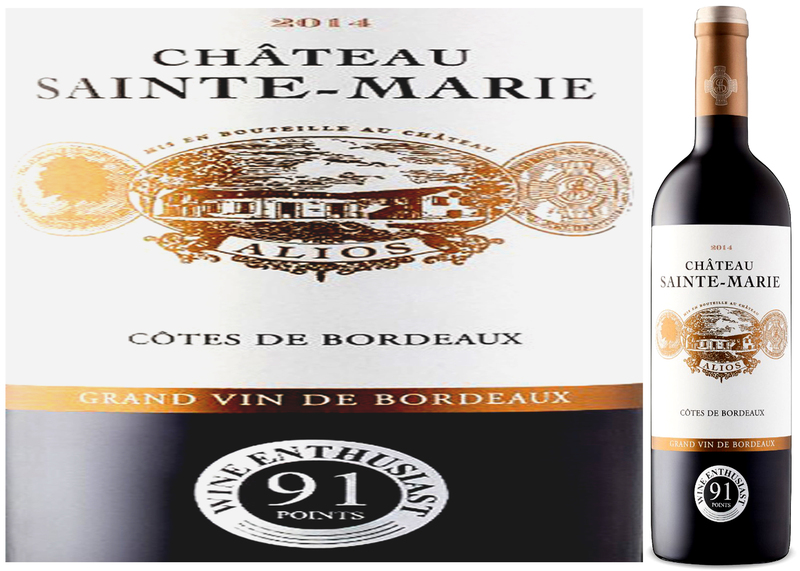 For this week’s feature of a Merlot-driven, Château Sainte Marie Alios 2014, the blend recipe by winemaker, Stéphane Dupuch, adds a dose of 20% Cabernet Sauvignon, and 5% Petit Verdot to lend a touch more boldness and body that’s expected of a baseline, Bordeaux red. With three years of ageing, from a harvest year that’s widely reputed to have produced balanced wine throughout the region, this is ready for consumption now — especially if you prefer brighter levels of acidity to counterbalance the tannins of bigger reds. It will hold for 3 – 5 years, should you somehow misplace several bottles in a dark corner of your basement? An introductory-level, Bordeaux Merlot that over-delivers at this price-point with dark berry flavours, ample oak character, and earthy accent of spices. Classic appetizer pairings such as Pâté, charcuterie, spicy vegetable pastries, or dinner mains such as lamb curry, tuna steak, Ratatouille with rustic sourdough bread, duck breast with fig chutney – would all be complementary for this medium to full-bodied wine.